Chaga Powder, which is boosts your energy and immune system, and is truly an amazing superfood. (But obviously totally optional in this recipe). 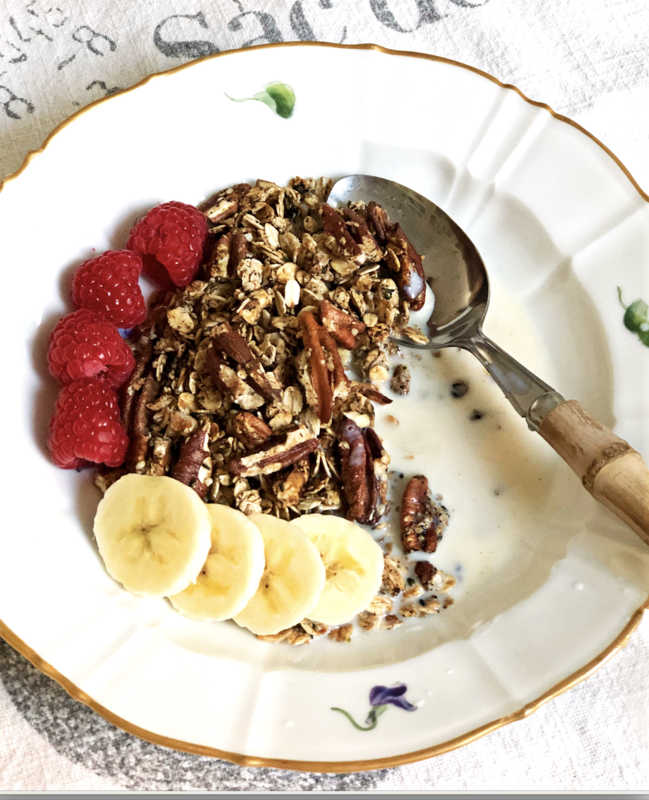 Pecans have the highest antioxidant profile of ANY nut, which is why you wanna go nuts with them in this recipe!!! *If you are diabetic, I recommend not using any syrup and add 2 cups of chopped pitted dates to the recipe after cooking. In a large bowl, combine all the ingredients really well. I recommend using a large metal spoon, and making sure that everything is really well combined. Spread evenly over the baking sheet. Place in the oven for about 20 minutes or until your granola is lightly browned all over – NOTE that you will need to go in after about 10 minutes and use a large spoon to carefully turn over the granola, bringing crispy bits from the outer edges in, because the top and the edges will brown much quicker. Remove from oven and allow to cool completely before storing in a large airtight container. You granola should keep fresh and crispy for up to 3 weeks in your pantry. Tip: Pour into pretty Mason jars and give as hostess or Holiday gifts! Get your Free Starter Guide today! !